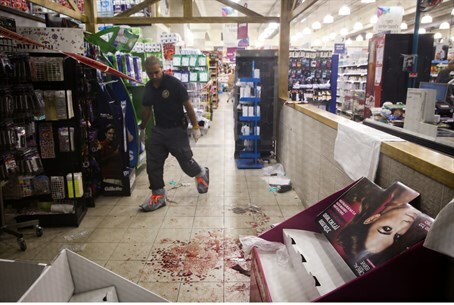 The Rami-Levy supermarket in Mishor Adumim re-opened its doors to the public Wednesday evening, only two hours after the terrorist stabbing attack, which left two people moderately injured. However, concerns and fear remained, particularly in the Mishor Adumim industrial area where both Palestinians and Israelis frequent for shopping and trade. Rami Levy, the CEO and owner of the grocery chain which bears his name and has branches throughout Israel, was asked by the media if he would consider changing the name of the chain if sales were to decline because of the attack. Levy responded sharply, saying, "If that happens, they will have murdered us. Someone who understands that should come here more and more." "We cannot let terrorists beat us," he added. In an interview with Channel 10 News, Levy stated, "The moment terrorists do something like this, it is on us to prove that it will not serve them. We will not let extremists spoil the coexistence here." Levy also addressed the recent wave of hatred being expressed by some elements of the extreme right-wing against Arab employees. Two of Rami-Levy's own Mishor Adumim employees were investigated by police in relation to Wednesday's attack, but were later released. "I have already proved that I will not let extremists beat us," Levy said firmly. "They only have one purpose here which is to spoil coexistence and destroy the country. I will continue on my way." Wednesday's attack at the joint industrial zone in Judea and Samaria seemed to break one of the unwritten rules of the current wave of terror across Israel. Although there have been a large number of security incidents in Judea and Samaria recently, they have never been in locations where damage would pose a risk to Palestinians who depend on it, such as the Rami-Levy supermarket. Despite the tension, it seems that for the time being the Rami-Levy branch in Mishor Adumim is back to business as usual. Shortly after the store re-opened, shoppers could be seen purchasing groceries - although there were notably less people than is usually common at that hour of the day.